The 2018 Toyota RAV4 is available in nine adventurous trim levels: LE, XLE, XLE Hybrid, Adventure, SE, SE Hybrid, Limited, Limited Hybrid, and Platinum. All non-hybrid models come with standard front-wheel drive (FWD) and available all-wheel drive. Hybrid models come with standard all-wheel drive (AWD). When it comes to style, comfort, and efficiency, there are few crossovers that can match the 2018 Toyota RAV4, which comes stocked with numerous premium features, including the Toyota Safety Sense™ suite. 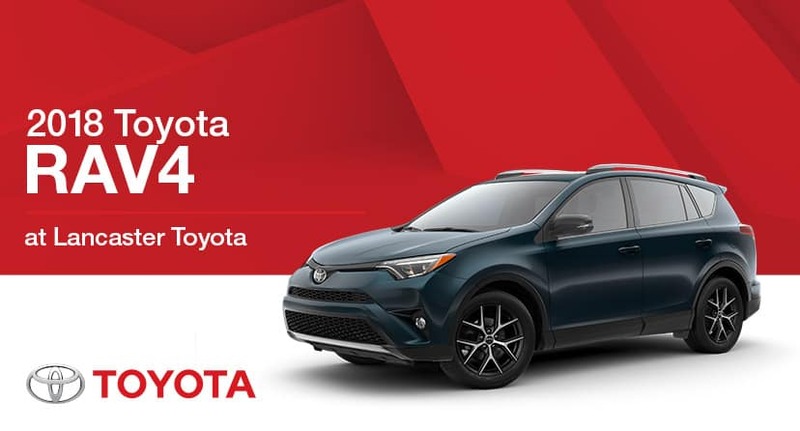 Check out the Toyota RAV4 at Lancaster Toyota.